Though it’s still a steamy 86 degrees outside, there have been quite a few signs that it’s time to say goodbye to summer. The sycamore trees in Riverside Park have already started to shed their leaves. If you wake up early enough in the morning, the breeze most definitely smells like autumn. Columbia undergrads back for the start of school have once again taken over our neighborhood. A part of me is absolutely thrilled that September is here—I’m beyond excited to be starting my graduate program in child development at Sarah Lawrence and I love, love, love the fall. But this Labor day weekend, another part of me also really wanted to cling on to the last vestiges of what has been a relaxing, fulfilling, and truly wonderful summer. 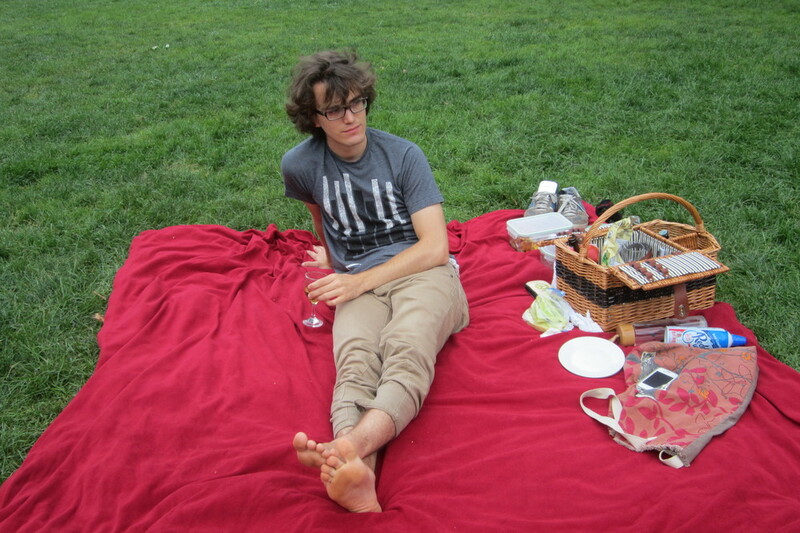 So naturally, I planned a picnic. Here you might say, do all of your leisurely pursuits involve food in some way? To which I would respond, funny you should ask—why yes most of them do! This is because we’ve discovered that preparing and consuming food not only nourishes us, but it awakens our senses; it evokes pleasure. It stimulates our creativity; it brings us closer together; it brings back old memories and helps create new ones. So you can see why I chose a picnic—our second picnic of the summer, in fact—to commemorate the changing of the seasons. Our picnic menu this time around featured primarily seasonal ingredients: berries, melons, tomatoes, fresh herbs, and the like. Simon was tasked with making panzanella salad, which, if you’ve never heard of it, is a classic summer salad from the Tuscan region of Italy. He chopped up some plum tomatoes, fresh mozzarella, red onion, and basil leaves. He also added in some sweet corn, fresh off the cob, and drizzled everything with an olive oil, balsamic vinegar, and Dijon mustard dressing. Mmmm. But the best step was the last step. Instead of mixing all the ingredients with spinach or lettuce or another typical salad green, we mixed in…. bread! Cubes and cubes and cubes of French bread. 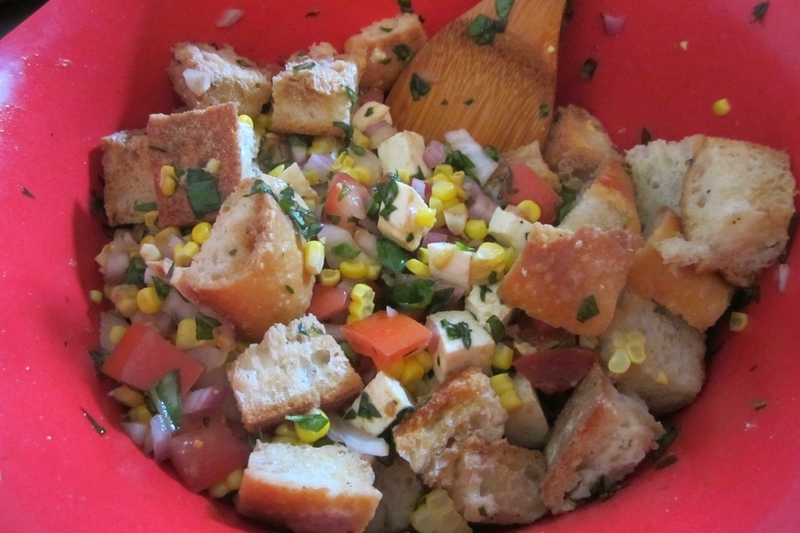 Bread is in fact the distinguishing element of panzanella salad. And though I was initially puzzled by its presence in the panzanella recipe, it turns out you can’t go wrong with replacing greens with carbs. No surprise there, I guess! While all this was happening, I worked on making a triple berry crisp. I took some creative liberties with the recipe and used my three favorite berries: raspberries, blackberries, and strawberries sprinkled with sugar (no blueberries for me!). As for the crisp, it was a mixture of flour, oatmeal, brown sugar, cinnamon, nutmeg, and butter that I got to mix together with my bare hands. Such fun! I did use one stick of butter less than recommended though, which turned out to be a great idea. I layered the berries and the crisp in a large glass baking pan and popped the whole thing in the oven for about 30 minutes. 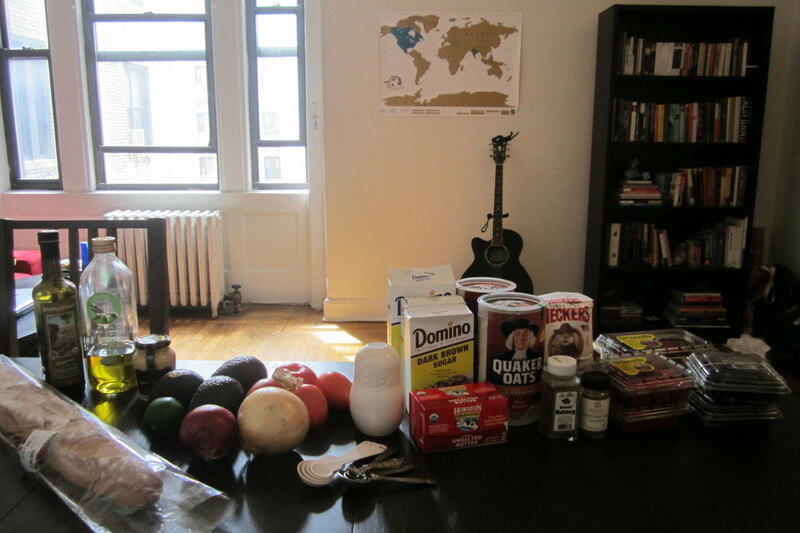 By the time it came out, in all its fruity, bubbly, golden brown glory, we had also prepared some homemade guacamole. And after packing everything into our wicker picnic basket, we were ready to go! 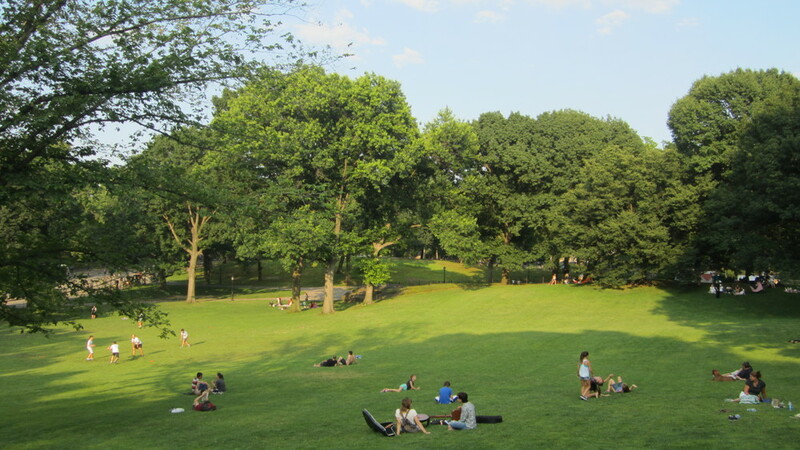 Our picnic spot of choice was one of our favorite little fields in Central Park, located between 69th and 71st St on the west side of the park. I’m not convinced the field has a name, but if you’d like to find it, it’s right by Le Pain Quotidien, a Belgian bakery chain that I love, and is surrounded by large, flat-faced rocks perfect for sitting, reading, or sunbathing. This field holds a special place in our hearts because it always seems to be populated by frolicking children, energetic dogs, cute couples and families, and generally happy people. Spending time there is always a restorative experience; it fills you with life. And on a more practical note, there are restrooms available there, which means you can comfortably stay for an entire afternoon or evening. So of course, we did. The weather seemed a little threatening when we arrived a few minutes after four—storm clouds in the distance with a chilly breeze approaching. But the rain held off, giving us the gift of one last perfect summer day. We spread out our red fleece blanket, served ourselves, snapped a few photos for this blog post, and ravenously dug into the panzanella salad, the guacamole, and the triple berry crisp. Everything was just beyond delicious. The panzanella was fresh and light, with all the right hints of sweet, tart, and spicy. The guacamole tasted like pure summer in a bowl. 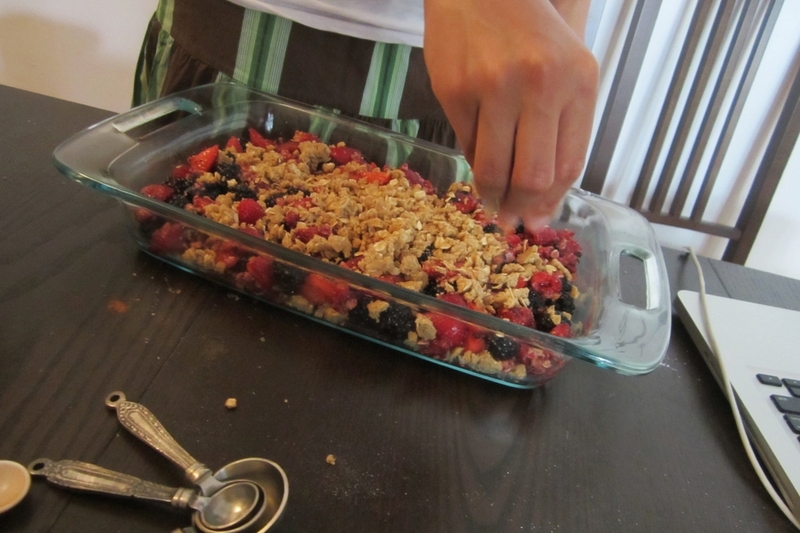 And the berry crisp…oh my. The blackberries, raspberries, and strawberries were vibrant in both flavor and color, and with the delightfully crunchy crisp, each bite of dessert made me very, very happy.